Google I/O started yesterday, and Google released an early access preview version of Android Studio, a new IDE based on IntelliJ IDEA with drag-and-drop GUI layout editor, Gradle-based build system, Lint tools, the ability to preview how apps look on different screen sizes, and more. This may eventually replace the Eclipse + ADT Plugin combination currently used, so I’ve decided to give it a try in Ubuntu 13.04 64-bit, but it’s also available for Windows and Mac OS X.
cd android-studio/bin/ ./studio.sh OpenJDK Runtime Environment (IcedTea 2.3.9) (7u21-2.3.9-1ubuntu1) OpenJDK 64-Bit Server VM (build 23.7-b01, mixed mode) OpenJDK 64-Bit Server VM (build 23.7-b01, mixed mode) WARNING: You are launching the IDE using OpenJDK Java runtime. ITS KNOWN TO HAVE PERFORMANCE AND GRAPHICS ISSUES! SWITCH TO THE ORACLE(SUN) JDK BEFORE REPORTING PROBLEMS! NOTE: If you have both Oracle (Sun) JDK and OpenJDK installed please validate either STUDIO_JDK, JDK_HOME, or JAVA_HOME environment variable points to valid Oracle (Sun) JDK installation. See http://ow.ly/6TuKQ for more info on switching default JDK. Press Enter to continue. please validate either STUDIO_JDK, JDK_HOME, or JAVA_HOME environment variable points to valid Oracle (Sun) JDK installation. 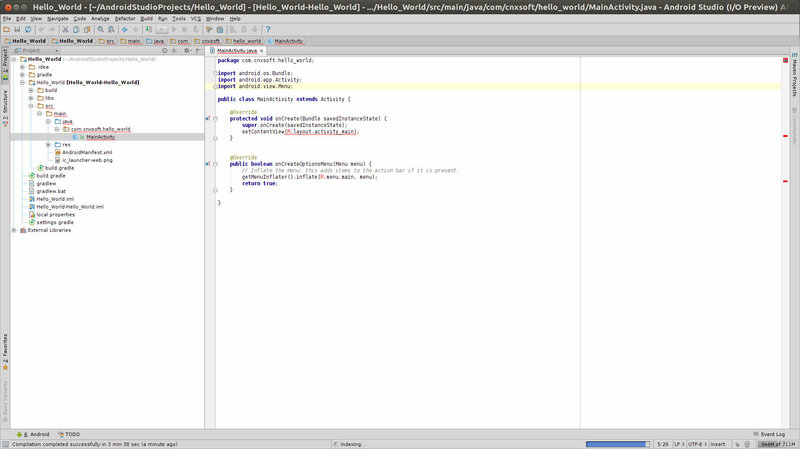 And I did press enter to continue, but Android Studio complained about JAVA_HOME no being defined. Let’s just install Sun Oracle JAVA JDK since this is the recommended method. I’ve used the instructions provided on Mark Loiseau blog to do so. Download the latest Sun Oracle Java JDK (now 7.21u) from http://www.oracle.com/technetwork/java/javase/downloads/index.html. For Ubuntu 64-bit, select jdk-7u21-linux-x64.tar.gz. Success! If you already have project based on Eclipse, Google Provides instructions to migrate your Eclipse apps to Android Studio, but today, let’s just start a New Project. You’ll just need to provide an application name (e.g. Hello_World), and change the Package Name (replace com.example by your own) to remove a warning, and click on Next. There are several options in the wizard, but I’ve just clicked on Next several times to complete the creation of the new project. The first time will take some time since Android Studio will download, install and configure Gradle build system. Now just open the “MainActivity” as shown below to see the source code. I’ll use the emulator for this hello world example, so we need to configure Android Studio to use it. 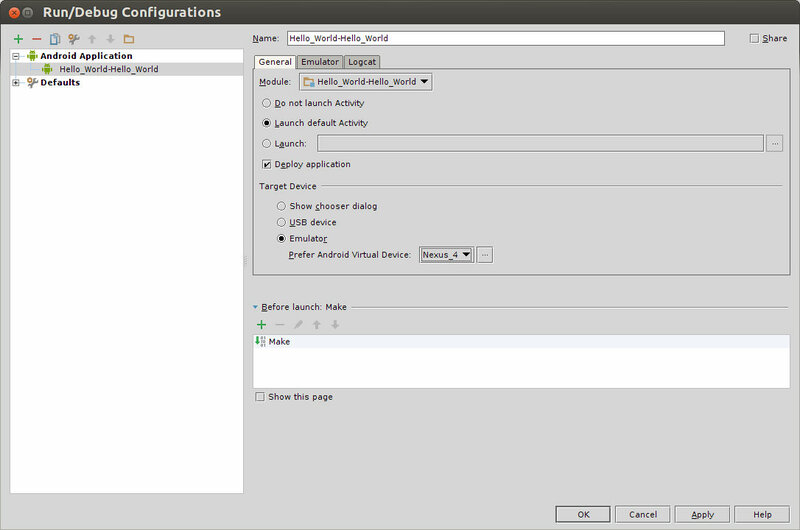 Click on Run->Edit Configuration, select emulator, and create a Android Virtual Device by clicking on … (e.g. Nexus 4), and click OK.
Time to run the application by pressing the Run icon (green triangle) or pressing Shift+F10. Now be a little patient, and after a while, you should see “Hello, Android” displayed in the Emulator. Further information is available in Android Studio Tips and Tricks page. You are so fast 🙂 Tired after staying up night watching google i/o live. 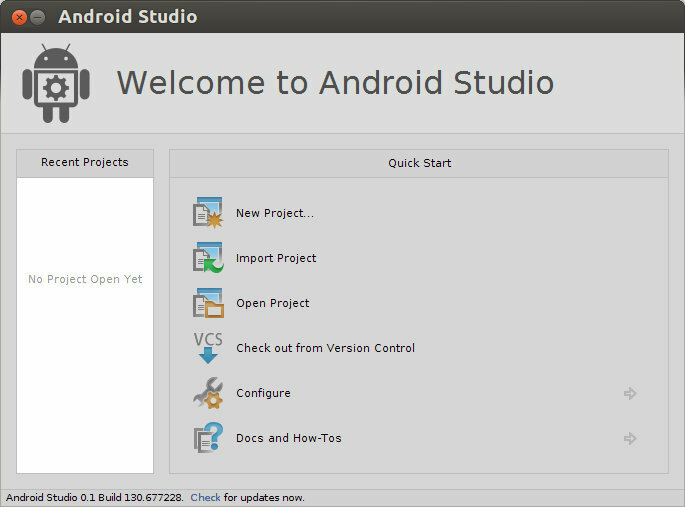 i have try to install android studio on my machine ubuntu 10.10 but its giving me an error “no project to open” what to do??? ERROR: Cannot start Android Studio\nNo JDK found. Please validate either STUDIO_JDK, JDK_HOME or JAVA_HOME environment variable points to valid JDK installation. Do you get that when you create a new project? Maybe you just need to set STUDIO_JDK, JDK_HOME and JAVA_HOME environment variables. You have to use oracle java. Yes, you’re right. Sun got bought by Oracle a while ago. I’ll change the name. I clicked the … button, but nothing happens. Can you tell me why? Thanks so much. It turned out to be that /opt/android-studio/sdk/tools/android does not have enough permission. This message showed up at the status bar of the Android Studio. @hertkof I had to remove openjdk. Be warned though this is remove LibreOffice if you use that software. I am also not able to install iit in my android ubantu. I am not getting any error message. It just stops itself after some time of processing. Just open a layout file, and the previewer will open automatically. This was such a great help and I can honestly say I wouldn’t have managed it without this. However, I am quite a n00b here, my drop-down for the emulated device contains no devices. How do I import device spec files or whatever it is that I need? Now it keeps “Waiting for ADP” and it won’t load, I keep on clicking “Wait More” but to no avail. fixed the issue. If it does not work, you need to check the messages in the terminal where you’re running ./studio.sh to look for clues. Dude, you are a legend. You have my Facebook “like” and my G+ “follow”. 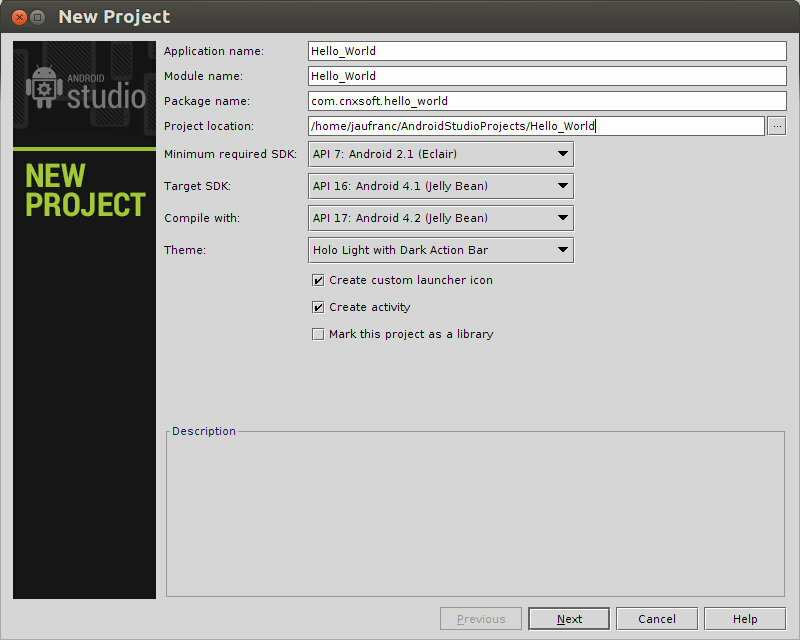 managed to install android studio thanks to your tutorial. But I was with a doubt over the shortcut icon. How do I create a shortcut icon to put the slash in the ubuntu? Just like any shortcut you would create in Ubuntu. Create a shortcut to studio.sh. Execution failed for task ‘:eds:processDebugResources’. Gradle: Execution failed for task ‘:Hello_world:mergeDebugResources’. Hi I got similar error the first time I execute ./studio.sh after decompression. How do you solve this problem? install sun/oracle java?